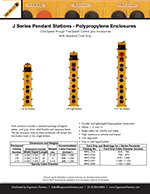 Ideal for cranes and industrial machines. 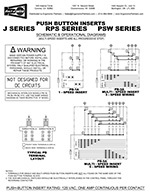 Push button pendant stations are an ideal way to control a motor using stepped inputs. These Duct-O-Wire pendant stations are typically used for crane applications, but have the ability to be utilized to control other types of motors, industrial equipment, and machinery. Multi-Step cord grip for 4 to 24 conductor cables with strain relief hook and cable clamp set. Polypropylene NEMA 1, 3, 4, 4X and 12 enclosures: Slim Back Profile (S) for ergonomic look and feel or Deep Back Profile (D) for extra wiring space. Large variety of switches available with replaceable neoprene switch boots and easy to read legend plates. Steel reinforced rubber coated enclosure construction with tongue and groove cover plate to protect buttons from elements. Each complete enclosure includes a standard package of legend plates, cord grip and strain relief bracket. 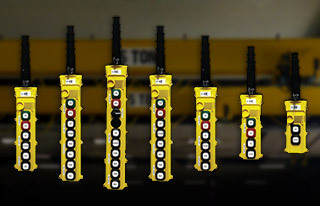 Large variety of single, two speed, momentary and maintained switches. Wire mesh grips for added strain relief are available. NEMA 1, 3, 4 and 12. UL Listed and CSA Approved. Ergonomic Partners provides Duct-O-Wire Pendant Push Button Stations; serving clients from coast to coast, Canada, Mexico and especially focused in the states of Missouri, Illinois, Indiana, Kansas, Arkansas, Mississippi, Nebraska, Tennessee, Kentucky, Iowa, and Oklahoma.